Lisa de Oliviera remembers being in Boston Medical Center, gazing at her daughter through the glare of the plastic Neonatal Intensive Care Unit (NICU) isolette, while she tried in vain to pump milk. A continuous positive airway pressure (CPAP) machine was whirring air into her baby’s lungs, her eyes were taped closed to prevent damage and tubes and bandages were draped over most of her tiny pink body. It was only a day since her unexpected birth at 23 weeks and 3 days, the very edge of viability for a preterm baby. “I’m bringing nothing but pathetic little drops,” Lisa lamented to the NICU nurse. The kindly nurse came over and extracted the pumped milk with a syringe. “Do you see what this says,” she asked Lisa. “It says .08 milliliters,” she guided Lisa over to the computer at the nurses’ station. “Do you see how much your baby should get? .08 milliliters. You are giving her exactly what she needs. ”The NICU nurses’ constant reassurances were a guiding light to Lisa and her husband during those bleak days. When everything seemed so out of control, Lisa threw herself into the things she knew she could do: pump breast milk and become an informed advocate for her daughter. Everything about Lisa’s pregnancy was unexpected. Her doctor had prepared her saying she would have difficulty conceiving naturally because of a seizure disorder that disrupted her hormones. So when some strange symptoms landed her in the emergency room, she could not believe the result of the positive pregnancy test. She and her husband were overjoyed with the news, but Lisa’s pregnancy was a difficult one. The embryo had implanted precariously on a blood sac on her uterine wall, causing bleeding and a lot of uncertainty. She was followed closely by her doctors at BMC and received twice weekly ultrasounds to ensure the baby was growing properly. Lisa felt reassured when the baby’s 19-week anatomy ultrasound was normal. Only four weeks later, Lisa went into labor. Luckily for Lisa, doctors were able to give her two steroid shots to help mature the baby’s lungs before birth. Twenty-four hours and three quick pushes later, baby Ariana was born weighing less than a pound. Her parents heard her cry before she was whisked away to BMC’s Elaine Ullian Neonatal Intensive Care Unit. Thus began the family’s new normal, staying bedside with baby Ariana and taking part in the complex day-to-day medical decision-making required to help their daughter grow. 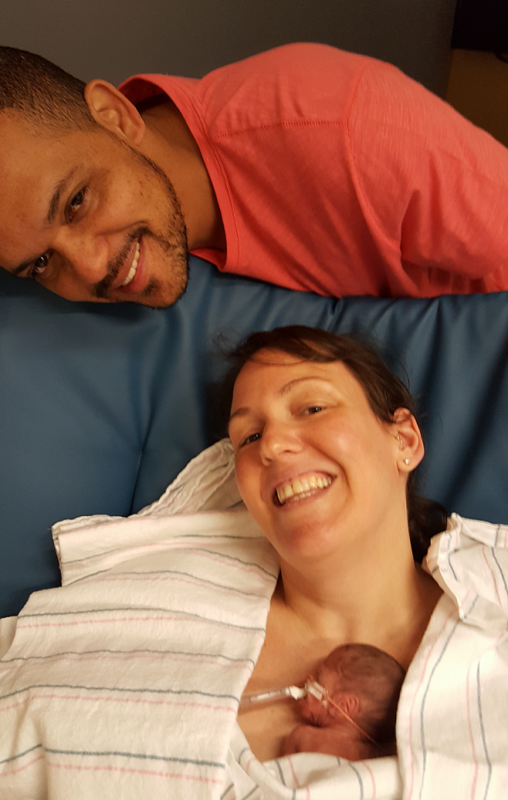 For caregivers at the NICU, caring for baby Ariana also meant supporting her parents. Noting Lisa’s wish to breastfeed, nurses taught Lisa how to use a breast pump shortly after her daughter’s birth. When Ariana grew big enough to require more milk, the NICU fed her donor breast milk brought in from a milk bank. Eventually, nurses and specialists helped Lisa and Ariana learn to properly latch and feed. Laying tiny babies into their mothers’ arms to touch their skin is also a priority once they are medically able. Skin-to-skin contact provides benefits to the baby, such as stabilizing heart rate and oxygen saturation. Skin-to-skin also benefits mothers by increasing oxytocin levels that can increase breast milk production. It also promotes mother and infant bonding and attachment. “Of course, I cried,” remembers Lisa of holding two-week-old Ariana for the first time. Soon her husband was also holding Ariana skin-to-skin and reading children’s books provided by a unique BMC program called Reach Out and Read. “Babies inside their mothers’ wombs are constantly hearing voices and there is some evidence that may contribute to early neurodevelopment. [Reach Out and Read] aims to combat the abnormal sounds babies hear in the NICU with their parents’ voices. It also provides positive modeling for parents to continue to read to their babies after discharge,” explains Parker. After an 18-week stay at BMC’s NICU, baby Ariana went home with her parents on January 8, 2017. Today at 10 pounds and counting, Ariana is thriving. Lisa still abides by the day-by-day mentality she was taught at BMC’s NICU, but she feels equipped to handle her daughter’s health issues thanks to the many doctors and nurses who empowered her during Ariana’s hospital stay. Boston Medical Center has a long history of serving the underserved families of Greater Boston.